After a long overdue lie in – I am on holiday after all- I decided to treat Matt to breakfast with a view. We headed to the patisserie just up the road from our hotel and grabbed two pain au chocolate to go. We then started the climb up Montemarte. With winding cobbled streets and little lanes we did take a few wrong turns but soon found ourselves among the masses on top of Montemarte. Montemarte is a beautiful area of the city filled with shops, art studios, bistros and art galleries. Don’t get me wrong it is rammed full of tourists but it very much feels like a small village within the large city that is Paris. We headed straight to the highlight of Montemarte: Le Sacre-Couer. A beautiful white church overlooking the entire city. We perched ourselves on the steps and enjoyed our breakfast. After taking in the view and people watching we ambled back down hill to catch the Metro towards the Eiffel Tower.We’d mistakenly not pre-booked our tickets before we arrived, took one look at the queue and thought we would leave it for the day after. Instead we headed up towards Troncadero Gardens to get a fantastic view of the tower in all its glory. In the evening we explored the bustling Latin Quarter. 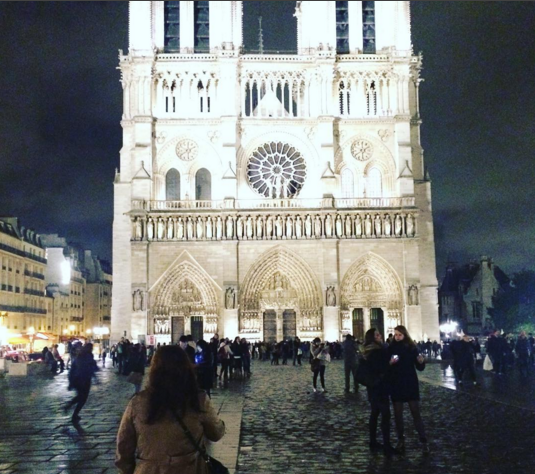 First stop was Le Notre Dame, looking beautiful all lit up. Next we braved the busy streets of the Latin Quarter and dived into a little bistro offering a great value Menu du Jour. We decided to eat all the stereotypical French dishes of soup a l’oignon, steak et frites, moule et frites and tarte tartin. On the way back to the hotel we snuck into a chocolatier and treated ourselves to some very exquisite chocolates! What are your ‘must dos’ for Paris? Have you got any great tips? Thanks Paula, pleased you enjoyed it. Thanks for your comment.